Some recent psychological studies have shown that scientists who tend to be anxious or uncertain put more confidence in their theories than relaxed, more calm scientists. This has generally shown to be the case with religious people, where believers are more likely to adhere to doctrinal beliefs when under stress or are uncertain – as long as they feel a structure and predictability to the message. 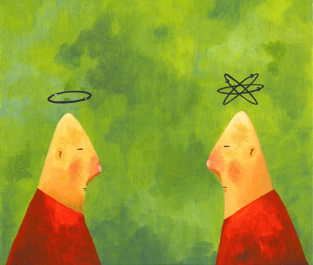 The studies suggest that scientists may subconsciously harbour religious traits all the while denouncing religion. Many scientists believe they have exclusive access to the truth. But what is truth when one is weighing up the theories of the cosmos, quantum things and nature? We love that reassuring sense of order but the predictable message is a sham. Deep down we know this but we truly want to be believers. The challenge for all of us is to embrace the ambiguity of life and accept the fact that living in this dimension is often uncertain. That is true beauty. An ever changing indeterminate universe. Humanity needs to be yanked from rigid scientific beliefs just as much as righteousness, for they create similar falsehoods in society. Is the Paleo Diet a Load of Bunkum?